Anyone seeking the “new” in neutral need look no further than dark gray kitchens. Of all the neutral colors in kitchens, dark gray looks freshest to me. That’s because black kitchens — by which I mean black kitchen cabinets as the predominant color — have been trending for nearly two years. Light gray kitchens have moved into the classic column next to all-white kitchens which now are the industry standard. What’s interesting to me about dark gray kitchens, as well as kitchens with dark cabinets in other hues, is that they the flip the white-cabinet, dark counter aesthetic of the black and white Something’s Gotta Give kitchen from the early 2000s. What I mean by dark gray is the colors of stones, storm cloud skies, fireplace ashes and dark metals like rolled steel. Used for woodwork during the 18th century dark gray is a historic look in the U.S. But the Brits get it and take it modern. 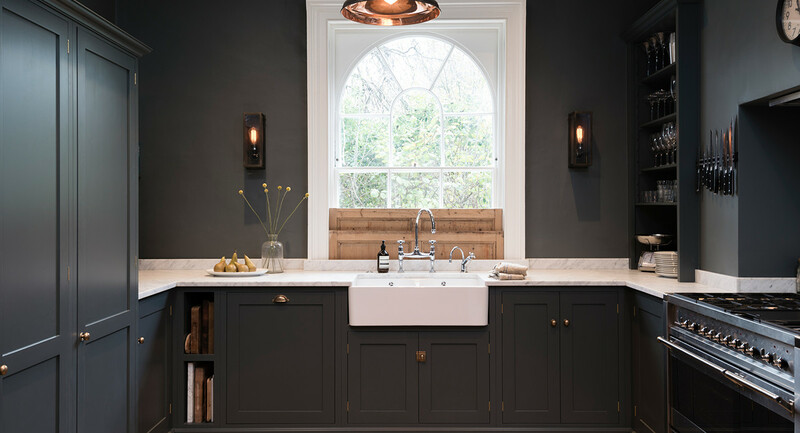 Consider this stunning dark gray deVOL kitchen in a London house [above] in a color called “flint.” Not only are the cabinets flinty, the dark walls wrap the room with drama. White woodwork around the window, coupled with white marble and a fireclay farm sink, creates a bib of brightness around the original arched window. I also love the natural wood tone mixed in from the house’s “highwayman’s shutter” which are like a solid set of double hung windows that can be raised and locked in place. Brass cabinet hardware and light fixtures help warm up this dark gray. Black accessories provide tone-on-tone contrast. 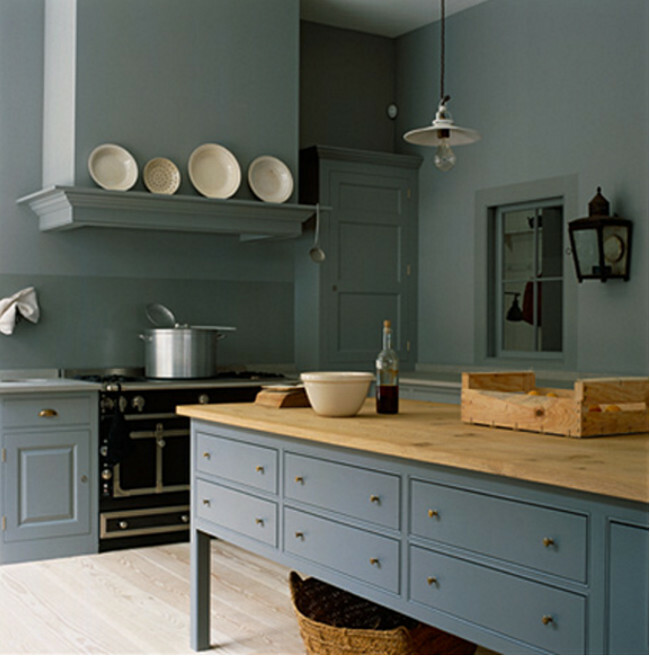 The iconic Plain English Spitalfields kitchen is a medium shade of blue-gray. For me, this is as light as dark gray goes. But it appears lighter against the reflective white-finished floor while the black La Cornue range and wrought iron lantern shows the contrast. The island counter is natural oak. 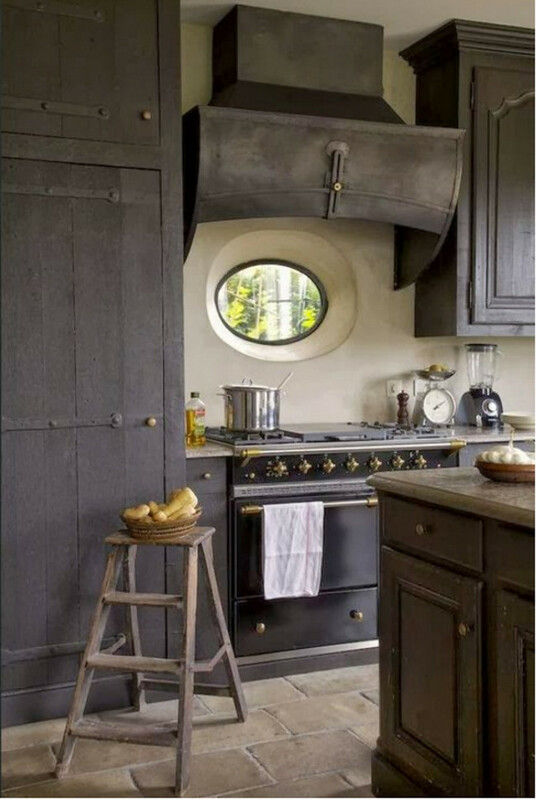 The metallic hue of natural rolled steel was picked up from the unforgettably charming and eccentric vent hood which looks like it could have been skillfully repurposed from half a steel drum. 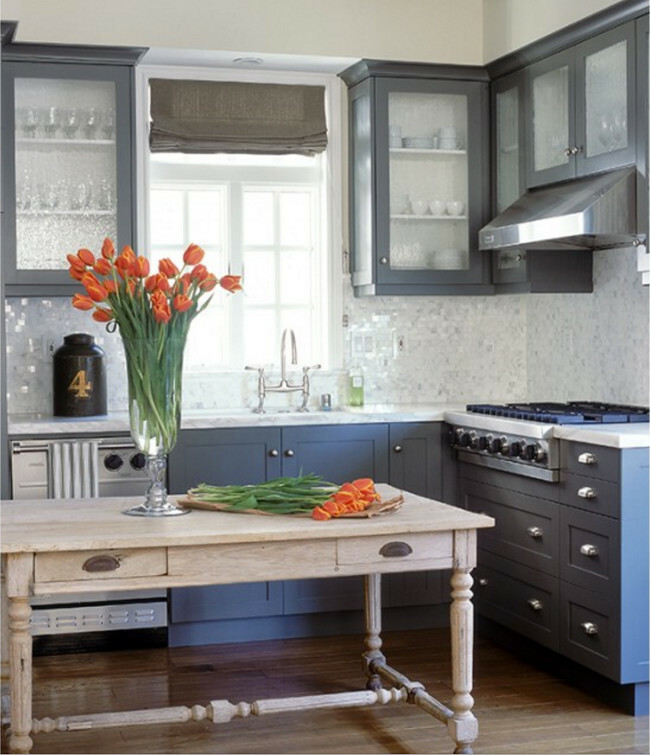 The steel gray cabinets are the same color but mixed — from the barn wood cupboard to the left of the black Lacanche to a provincial style upper cabinet on the right. There’s a slightly different style of beaded door on the island. I’ve seached for information on this kitchen but could not find the original. So sorry! Judging from details like the thickness of the oval oeil de boeuf window casement over the range, plaster walls and well worn stone floor, a European source seems likely. My guess would be Belgium or the Netherlands. While the walls are off white, granite counters fall into the beige-brown family — a range of colors often found in beach pebbles. If the color scheme in this kitchen was inspired by he hood it was the right choice. 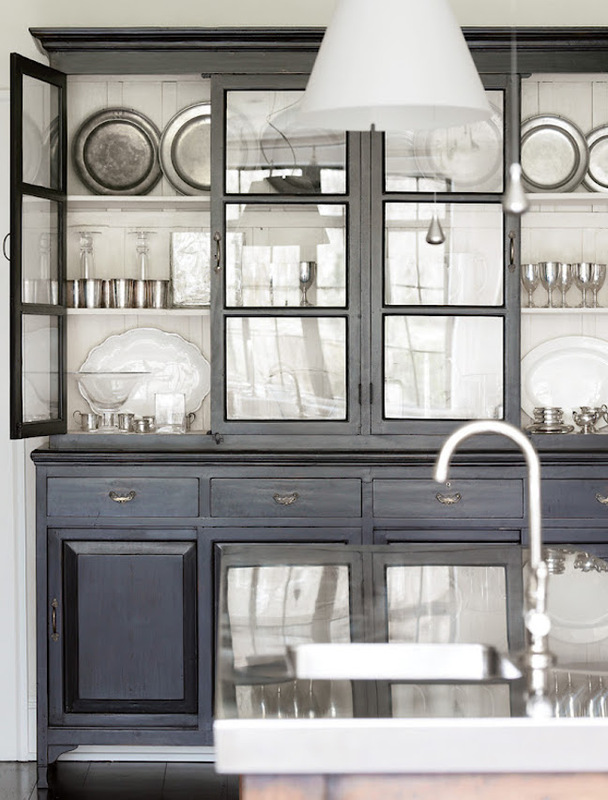 A dark gray painted hutch in an Atlanta kitchen pops agains the white walls. The matte finish has the wonderful quality of old furniture. Painting the interior and white helps the look along. Silver and pewter accessories point up the metallic reference of a cabinet color that reminds me of tarnished silver. 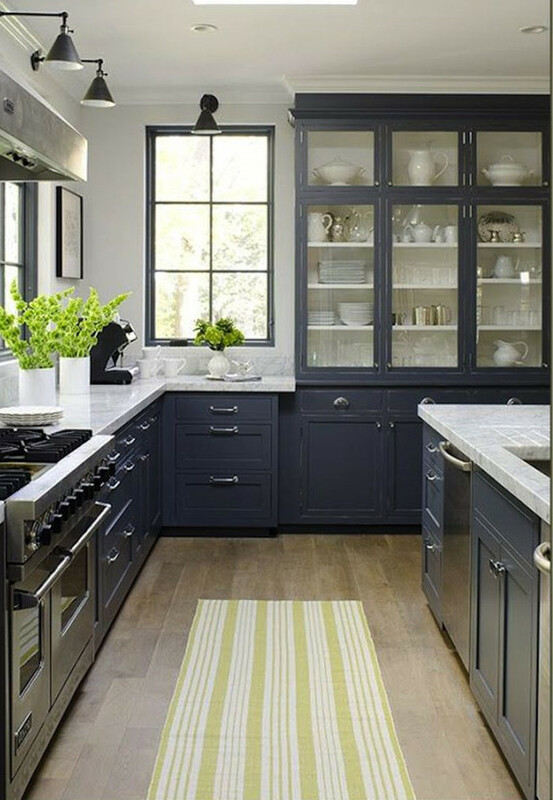 In this Maine kitchen by Jeanne Rapone, sophisticated dark blue-gray cabinets, with a slight sheen, look great with Carrara marble counters. The dark gray blends with the stainless of Viking range and a pair of stainless-door dishwashers. The cabinet color is also consistent with the steel window trim and off-black sconces that provide task lighting. This same kitchen was featured in my post on Mega Storage Cabinets, too. While I don’t care for the short stone return on the range wall it has a lot to offer. 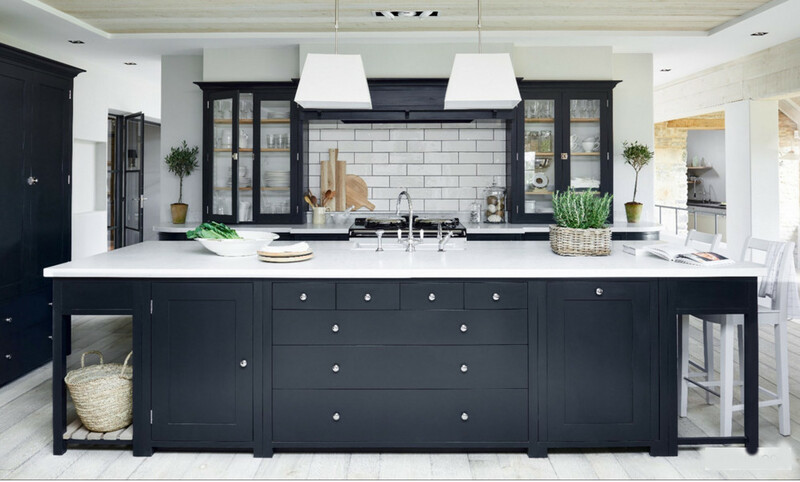 A color called Charcoal is combined with white in Neptune’s Suffolk kitchen. Upper cabinets flanking the range have white backs here, too. All the better to blend with the darkly grouted white subway tile backsplash. Here’s another kitchen reversing the colors of cabinet and counters along with tweaks like the white-finished floor. I love the glitzy polished marble mosaic backsplash tile in this dark gray Southern California kitchen by Santa Monica designer Chad Eisner. One variation here is the natural wood worktable/island along with a medium wood-tone floor. While still keeping things neutral, those elements warm up the kitchen and the terrific turned trestle table gives it a singular gives look.